Thai is a handsome 7-year-old seal point Siamese cat who was presented to our clinic several months ago for lethargy and anorexia of three days duration. A physical examination showed that he was moderately dehydrated, painful in his belly and most importantly, his skin was yellow. Because his owners had purchased pet insurance early on, they were prepared for Thai’s health care costs. This yellow color to the skin and mucous membranes is called jaundice, and in cats it usually indicates liver disease. Less commonly, it can be seen in diseases involving anemia where the body is destroying red blood cells and the waste products build up causing the yellow color. 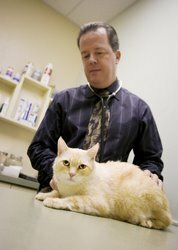 Jaundice always points to a serious illness, and as a veterinarian, I cringe when I see it because I know the cat is potentially in big trouble. Thai was hospitalized and started on intravenous fluids. Blood samples were obtained, and a pain patch was placed on his back foot. Test results ruled out anemia, but pointed directly to problems with the liver and gall bladder. One of the main liver enzymes in the cat is called ALT and it should measure less than 100. Thai’s value was elevated at over 1000! It was mostly likely caused by liver inflammation with possible infection. He also had bilirubin levels almost 25 times normal. Bilirubin is a break-down product of bile that is normally made in the liver and released from the gall bladder into the intestine to help with digestion. If the bile is prevented from leaving the gall bladder, too much bilirubin can remain in the blood eventually leading to jaundice as with Thai. He was started on antibiotics to help with possible infection in the liver and gallbladder which are connected. Thai was continued on supportive care the next day. He ate a small amount of food, but still had belly pain, jaundice and mild dehydration. An abdominal ultrasound was performed on day 3, and Thai was found to have an obstructed bile duct. It was planned to transfer him to the local 24 hour emergency and referral center the next day for an expensive, but potentially life-saving, exploratory surgery and treatment of the obstructed bile duct. Thai must have been listening to our conversations about surgery, because by the next morning he was eating and feeling better, and his ALT and bilirubin values had decreased by half. Surgery was postponed, and new medications were added to his regimen to help the liver and gall bladder heal. Thai continued to improve, his jaundice color began to fade, and he was released from the hospital on day 5. He continued on antibiotics and gall bladder medications at home , and 2 weeks later his liver and bilirubin values were almost back to normal and he was doing great. We’ll never know for sure what caused the bile duct obstruction, but Thai’s owners were thrilled to have their talkative boy back to good health and part of their family again. They were even happier that they had made the decision to purchase pet insurance for Thai with Pets Best Insurance. It gave them great peace of mind that cost was never a major factor in making medical decisions for their beloved pet. I remember the owners mentioning to me how pleased they were with the benefits, coverage and quick turn-around time on claims. This was before I even knew about Pets Best Insurance and before I started writing blogs for the company, so be assured that this is an unbiased, true testimony! I encourage pet owners to check out the facts to see if pet insurance can help their furry friends enjoy longer, healthier lives too.